“I’m dreaming of a white Christmas …” I am! I had enough of these 100 + temp days! How about you? Well, if I cannot have a white Christmas right now, I will settle for milder summer days in the north woods of Minnesota with friends. Dean & I are headed there for a few days! Need to hear the loons once again! It is a lemonade summer evening, maybe the hard lemonade kind tonight. Trying to make lemonade out of lemons! We had 2 vehicles break down this past week, one fixed and another one to go. Then we had a fender-bender with our white beast of a van this morning parking near my work in Clayton. Did not damage the beast, but the nervous lady’s Mercedes luxury sedan has some damage near the bumper. I think Dean will be ready for that spiked lemonade. Maybe watch a summer rain storm come in tonight. What is your favorite lemonade? 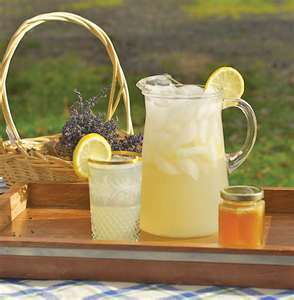 I found a recipe for Lavender Lemonade, and adapted it to suit my tastes. I cannot wait to try with the crop of lavender in harvest season right now. 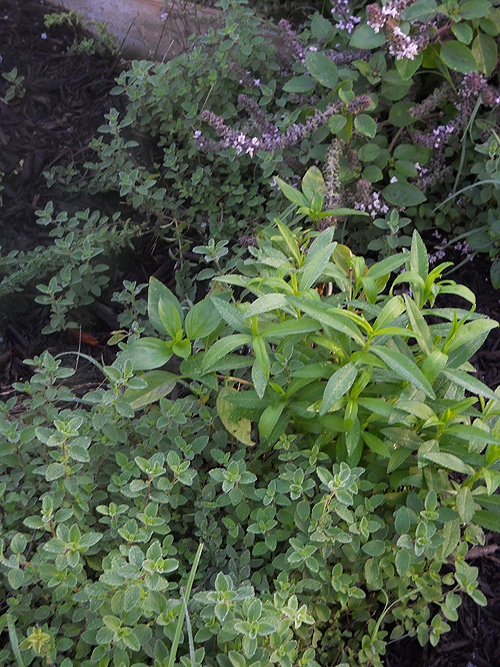 This herb is beautiful, fragrant, and so versatile. Where is the bottle of vodka in this picture??? St. Louis, Missouri and surrounding areas have encountered 10 days in a row of record high temperatures, triple digits with no or trace rain for almost a month. The corn is turning gray and rustles with the wind like fall leaves. We have had to water our plants 2 times a day during the drought. God, the plants need rain! Nothing beats real rain water! It finally brewed up yesterday, some places more so than others. We marketed at the Chandler Hill Vineyards Farmers’ Market yesterday afternoon, watching the clouds turn to thunderheads and shift different directions. Wind gusts would sway the tents one direction and switch in another minute. Maybe movement for the better? On our trip home we left the storm further behind us. Awesome views while in the wine country hills of Defiance. But yesterday evening finally my hometown St. Peters received 1/4 – 1/2″ of rain with the summer storm. My cats even seemed curious about that rumbling outside. We had not heard this in weeks. Hallelujah, our rain buckets are full now! Our plants are saying “aaahhh!” Another summer storm is brewing up this afternoon. Maybe more rain?! 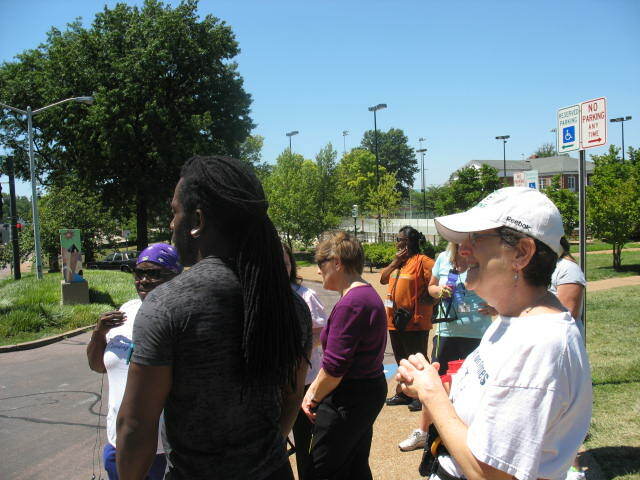 Every Tuesday and Thursday the employees of St. Louis County have an opportunity to walk the streets of Clayton, Missouri. Our personal trainer from Gold’s Gym, Phil brings us out of our offices and work stations to the beautiful outdoors. Absorbing vitamin D in the sun and breathing fresher oxygen all the while exercising. In a fleeting moment I captured a photo while we waited for the traffic light to change. Happy walkers, we are!